Anterior cruciate ligament (ACL) injury is one of the most common severe injuries affecting the football player. 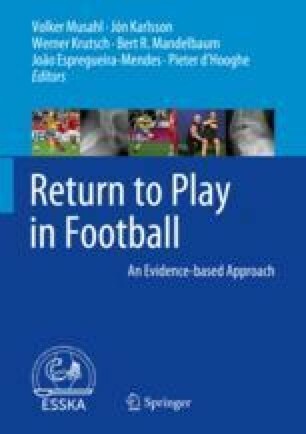 The surgical management of ACL injuries with ACL reconstruction is often the treatment of choice for the football player aiming to return to pre-injury level. However, the return to play (RTP) reports after ACL reconstruction (ACLR) indicate that a considerable percentage of patients do not RTP after ACLR. It is likely that many factors interact in a complex manner to determine the ability of the athlete to RTP. The aim of this chapter is to present a comprehensive vision of the factors affecting RTP rate after ACLR, giving to the clinician a potential tool to improve counselling and target the treatment strategy to increase RTP after ACLR.